Prophecy or fortune telling using printed cards which are used in gambling or games: The system of cartomancy includes modern packs of cards and even special divination cards that have been produced for this purpose. 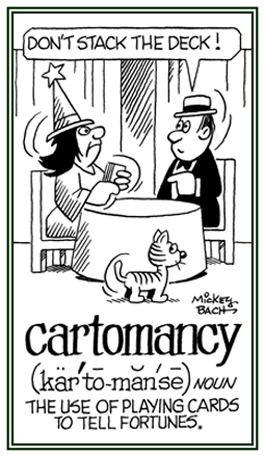 Cartomancy is said to originate with gypsies who prognosticated the future and provided guidance as to how to reveal the personality traits of people. Divination by looking into images on the surface of water in a glass or in a magical receptacle. If spring water is used in this method or if the diviner uses a sacred pool or spring, then it is termed pegomancy. Divination with a crystal ball, a lens, mirrors, or other reflective surfaces: At the fortune teller's booth, Mildred, the costumed woman, sat with a crystal ball, ready to practice her catoptromancy when requested. The Greeks put metal "mirrors" under the water or held them in a fountain and interpreted the reflections with catoptromancy. Predictions of catoptromancies were also made by using a glass which was suspended over a holy well; the images on the glass supposedly "revealed" the secrets hidden in the water. Catoptromancy also included divination based on how a face appeared when it was seen in a "looking glass" underwater. Prophecy with the use of brazen vessels. Divination by interpreting the ashes from a sacrifice. Divination by boiling a donkey’s head on burning coals. Divination by dropping melted wax into water and observing (interpreting) the figures made there. During the Middle Ages, wax would be melted in a brass container and poured into another vessel containing cold water. 1. Divinations, or telling fortunes, by means of activities in the air; such as, rain, thunder, lightning, etc. 2. A form of divination involving the interpretation of an omen communicated by thunder. Divination, or presages, by observing and interpreting confusion or disorder; observed in clouds, airborne apparitions, aerial visions, or comets. Divination with maps; interpreting inscriptions. Predictions written in invisible ink, that appear when papers are heated, come in this general category; and so do greeting cards. Divination by interpreting the utterences of a person who is in a frenzy; dating back to the Greek Oracle of Delphi. Divination with a crystal ball. Showing page 4 out of 16 pages of 227 main-word entries or main-word-entry groups.